This page will provide you with information about having a shoulder arthroscopy. For further details, please speak to your consultant. What is an arthroscopy of the shoulder? An arthroscopy is a form of keyhole surgery. 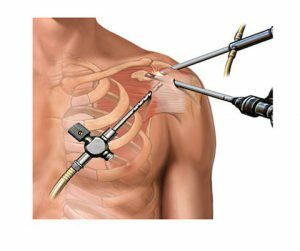 The surgeon is able to look inside your shoulder using a camera inserted via small incisions to the shoulder area. Some problems can be treated using surgical instruments. Surgery confirms what the problem is and in many cases the problem can be treated at the same time. CT and MRI scans can be used to diagnose problems within the shoulder joint. Often an arthroscopy would still be needed to treat the problem. The procedure is usually undertaken with a general anaesthetic and is often completed within three quarters of an hour. Between two and four small incisions will be made by the surgeon around the joint. A small telescope is then inserted through one of the incisions enabling the surgeon to examine the joint. Surgical instruments can then be placed through the other incisions enabling the surgeon to treat any problems. Usually you will be discharged the same day as your operation. To help with recovery your physiotherapist may give you exercises and advice. Returning to normal activities can take up to three months, but frequent exercise will help you get back to normal much sooner. Before you start exercising be sure to seek advice from the relevant healthcare professional or your GP. It will take time for the pain to lessen and for movement to increase, but most people will experience a very good improvement. However, symptoms may come back in the future. Using this procedure your surgeon is able to diagnose and treat the problem around the joint. Due to the less invasive technique, an arthroscopy usually reduces the amount of pain you feel and it will ensure a speedier recovery after surgery.